+ you look amazing, as per usual as does your friend . WOW!! that is great!! Congratulations!! how exciting!! That first picture is mind blowing! I love the bag Karen did, it’s gorgeous. I need a better look at her shoes. I need your coat/jacket, so cute! Your outfit is genius, and I’m still eyeing your shoes haha. +Seriously CONGRATS on making it on vogue, I would just die! + Nothing screams living in NY is amazing more than you two. 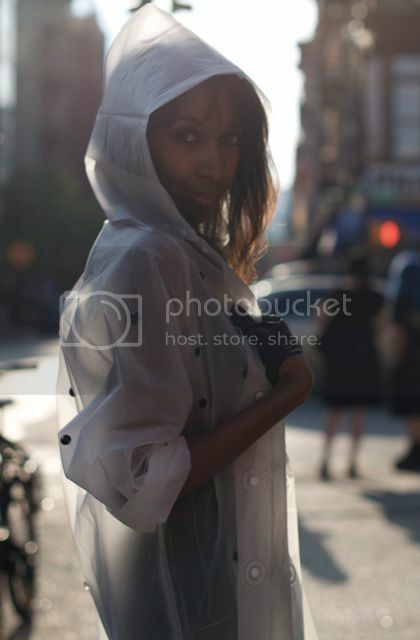 Swarovski crystal + raincoat= genius. It looks like such an expensive coat. and studded all stars would be BOMB, so do it! Great photos!! Love the shoes in the first pic.!!! how much fun can one person have? a lot! everything looks great. all the sparklies in the sunshine. and congratulations on that beautiful write-up and legging wearings in vogue.com. nice! awesome pics and look as usual! Cuteeeeeeee skirt. Where’d you get it?? great photos! ilove what your both wearing. Awesome outfit this post (as usual). En super gaaf die stenen overal op! En grappig dat jullie allebei andere foto’s kiezen!! OMIGOD! That is incredible!!! You’re so talented! You definitely deserve it! wow, you are incredibly fantastic as always… i’m floored by your friend karen too. and kudos on your lauren sto domingo endorsement! HUGE deal. congrats! love these pictures. you and your friend are beautiful! i’m so happy and proud of you! I swear that first photo is right out of a magazine…you ar gorgeous! Congrats on the mag mention! PS. I love that 1st photo, reminds me of a cross between an angel, a ballet dancer and a magical fairy. I didn’t know that you made those Rodarte-like leggings! They’re amazing!! congrats on the that Vogue clip! =] You’ve got some sweet style, hope to see more! omg that is so cool!!!! i guess you better make 100 pairs!!! cuz they are gonna be huuuuuuuge!!!! Sweeee-eet! Congradts! I want a pair to rock out in! im so jealous, i want to be playing in the streets with you guys! oh, and you must write me and let me know if those boots are comfy, im in love. you look gorgeous! wow, wow, WOW! that first picture is breathtaking. and congrats x100 on the vogue plug!! that’s fantastic. Congrats! I love your blog and you always look amazing! Those shoes are crazy!! Im so envious! Your friend looks amazing too! That first picture is absolutely stunning! I always love your collaborations…you are both so damn stylish!! Loving you tutu..the hemline is perfect and looks so cool with the rain coat. Congratulations on the online Vogue feature! Absolutely gorgeous, im so in love wit what you guys did with the raincoats. and WOW awesome mention in Vogue! hey lovely,you look like the #1 princess.gorge.i like your friend, she seems fun.you look fresh together.congrats to the feature!diy galore! i love all of these photos! wicked cool! i love the tutu and raincoats! mooie rok heb je aan! de diamant-lookalike stenen op je jas zijn een mooie combinatie en de hele outfit staat prachtig bij je bleke huid en blonde haar.. en gefeliciteerd met je artikel! wow i love all the photos, esp your dress! That article was how i came across your blog! Love it all, esp your inspiration pictures!! These photos are amazing. I love everything sparkly! Congrats on your Vogue feature. congrats for making the mag! u did an awesome job on that diy. also love the first photo in this post. that skirt is incredible. Love your skirt. I love contrast skirt & background. So perfectly! Ahhhh sweetie,congratulations on your Vogue feature!! i have the same black raincoat! except…not gemmed out and fantastic, and i cut it longer. love these looks! i love your coat, so stylish!! !